There are many colors and types of brick but the most popular by far is red. This classic, all-American look has a timeless appeal. From clean, straight lines to rustic uneven edges, your bricks play the lead role in any red brick exterior color schemes. A medium to dark neutral trim is well suited to a full brick home. Highlight architectural details by using it to frame windows and doorways. A deep or dark color on the door draws attention to the entranceway. Bricks are naturally toned down but that doesn’t mean neutrals are your only option as the main color. For example, gold with a dollop of gray mixed in is beautiful with warm red bricks. Other muted colors can work equally well. When your home has a brick with a distinct pattern, use colors that don’t compete for attention … such as a combination of warm gray and light greige. Balance the power of the pattern with a strong door color. Red brick can be warm with tones that lean towards rust or terracotta. They may also be cool and be closer to burgundy. Determine the color temperature and find a harmonizing palette; in this case cool colors. A deep or dark color has traditionally been used on the door of a brick home, but it doesn’t mean you can’t use a lighter or brighter paint. Use a similar or complementary color that is a bit muted to blend with the scheme. Red brick and a multicolored slate roof are the perfect pairing. A few well-chosen colors complete the look. When using the slate to inspire your accent colors, find tones that are slightly more vivid. 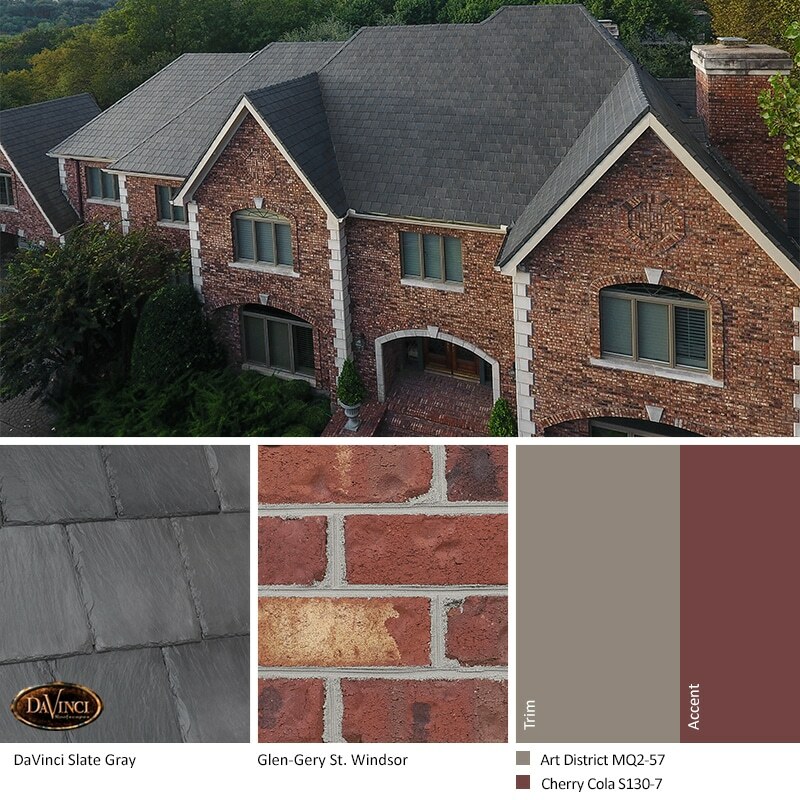 Let the colors of multicolor slate inspire your red brick exterior color schemes. With the Vineyard blend, slate gray and white build a beautiful canvas for colonial gold, olive green, or brown accents. As the complement of red, green can be intensified when paired with your brick. To keep the green from looking too vivid use a grayed or muted green. Complete the palette with equally muted hues or neutrals. The look of antique bricks goes hand-in-hand with a palette of historic colors. The two intriguing shades of gray and brick are brought to life with a striking deep brick red front door. Crisp reds retain their fresh look when partnered with colors that are clearer rather than toned down. Light cool gray and a bold pop of color at the front door are a contemporary combination. By following the tips above you can find a color palette to complement your brick. 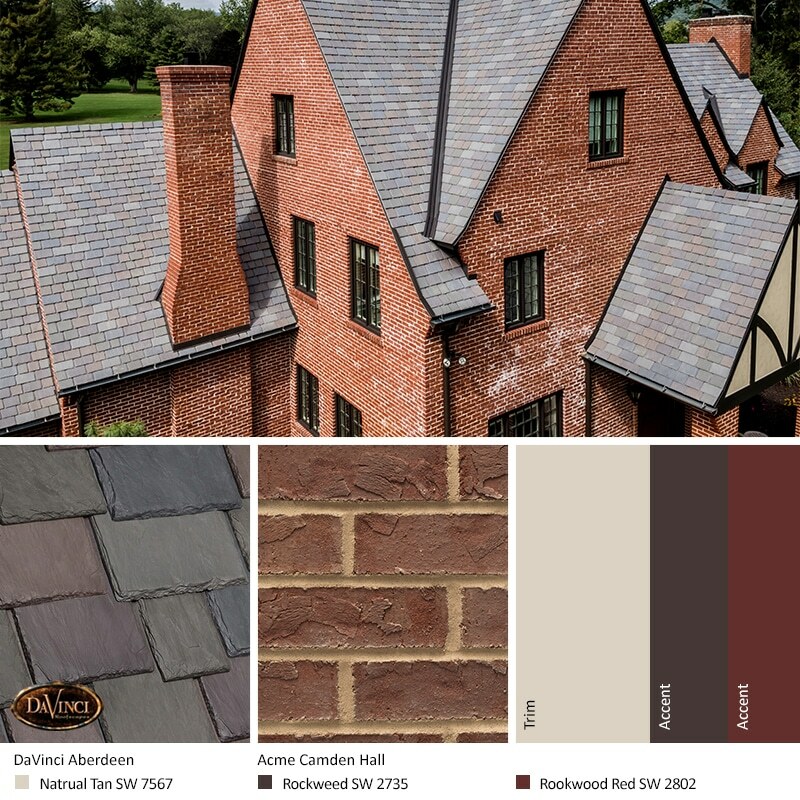 Then for even more helpful information, download our complete guide to select red brick exterior color schemes – FRESH Home Exterior Color Schemes for Brick and Stone.